G-TEC has gas booster systems capable of up to 45 psi and 500 cubic feet of gas per hour. Why is high-pressure natural gas the right fuel for your classroom? leaks sink to the lowest place in the building and collect there. Any spark could cause a fire and explosion. G-TEC systems do not need special site preparation such as outside ventilation, they are quiet and can be installed right in the studio work area. You’ll never run out of natural gas because a G-TEC Gas Booster is connected right to the utility natural gas pipe! Propane cylinders seem to run out of gas right in the middle of a project. You have to remember to check and change cylinders so it takes longer to get ready for class. With a G-TEC system you just turn on the gas booster and you are ready to begin making glass beads, or whatever your project is. There’s no carbon buildup on the tips of your torches because natural gas has very little carbon to begin with. You don’t have to clean carbon buildup off the tips of the torches and students don’t get flecks of carbon flying into the glass. Natural gas is easier on the eyes because the flame is not as bright as a propane flame so there’s less eyestrain and it is easier to see your work! For equal heat, natural gas is half the cost of propane! That’s right, you’ll cut your fuel gas bill in half when you switch from propane to high-pressure natural gas. Call G-TEC to design the right gas booster for your studio! Tell us what type of torches you are using and how many torches are in the studio and we can specify the right G-TEC system for you. 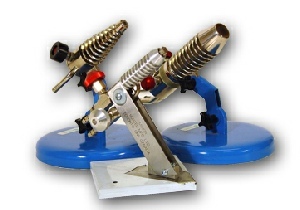 Models range from a TB-60 Torch Booster that will run 6 minor torches up to the TB-500 that could run 50 minor torches or 15 mid-range torches at once. Let us design a natural gas system that will make your studio safer, help your students build their skills more quickly, and give you one less thing to worry about! 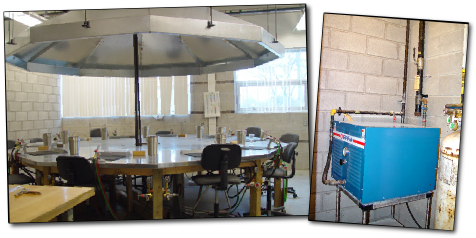 Sheridan College near Toronto uses a TB-500 Torch Booster to supply its glass lampworking studio. 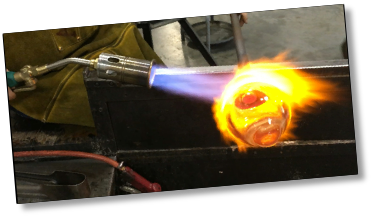 Sheridan operates one of the largest glass art educational programs in North America. will work better with high-pressure natural gas. I had been on natural gas without a booster—pretty pitiful. But now I really feel that I have all the flame I want! Glass lampwork or hot glass, or both?